SOLID 10K Yellow Gold Womens 2.5mm Figaro Link Chain Pendant Necklace 18in 18"
14K Yellow Gold Diamond Cut Womens Dainty 1.5mm Rope Chain Pendant Necklace 18"
GUARANTEED 10KT PURE GOLD | 16" 18" 20" 22" 24" 26" 28"
Elegant, fine fox tail link chain necklace in solid 14k yellow gold. Small “c” clasp. Stamped 14k Italy. 18 inches long. 3.0 grams. Approx. 1mm wide. Excellent condition. Beautiful on its own or with a pendant. Gold Type: 14K Yellow gold. Other: Spring clasp. 14k Solid Yellow gold Wheat / Foxtail chain necklace. Gold : 14k. Weight : 2.50 grams. All gold are 100% genuine. Not plated. Angel wings heart locket is made of genuine 925 Sterling Silver. The angel wings open to unfold a special place to put a photo or trinket. Includes an 18" 925 Sterling Silver cable chain with spring ring clasp. Expertly detailed and crafted, this King Lion head pendant in high polished shiny 14K yellow gold with CZ accents. FREE leatherette jewelry box! Downtown Los Angeles - the Jewelry District. B EST Q UALITY & V ALUE. Chain Type: rolo. Stone Weight Back Finding You must complete your order using the CheckOut process. If the item you receive is not as described you get your money back. Height: 14 MM. Jerusalem cross pendant is made of genuine 925 Sterling Silver. Includes 18" 925 sterling silver cable chain with spring ring clasp. Stamped 925. Necklace Details. This attractive necklace showcases a red pendant necklace that is made with swarovski crystals. Chain Type: rolo. You must complete your order using the CheckOut process. Stone Weight Height: 14 MM. 14k yellow gold bonded over solid 925 sterling silver! Gorgeous Italian ladies cross. Bracelet & Chain Sets. Ladies Jewelry. 925 Silver Jewelry. Solid 10k/14k Jewelry. MADE IN ITALY! Stamped: JCM 14K on the fob and 585 on the clasp. 14k Yellow Gold. 16 - 18" Gold Chain. A beautiful necklace when worn. Crystal Drop is approx 1.5". Perfect Gift or for Resale. Necklace Style:Solid Cable (resembles Rolo). We have been specializing in diamonds, diamond cutting, custom, catalog and secondhand jewelry, watches and coins since 1980 and recently our newest product "Mastering Diamonds" a self-instruction course for the diamond trade, is now available. 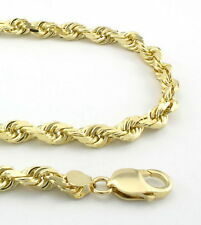 13g,4mm,10k Solid yellow gold curb chain,18" gold chains,real gold,real gold . Condition is Pre-owned. Shipped with USPS First Class Package. 16" 18" 20" 22" 24" 26" 28" 30" AMAZING QUALITY! Gift this minimalist necklace to the one you love. Crafted in high-shine 14K gold, this love knot necklace gets an updated 'twist' with its modern bar design. Feature piece measures 5/16 by 7/8 inches with a total length of 18 inches. Love Knot Design 14K Gold Measures 5/16 by 7/8 Inches 18-Inch Cable Chain Spring Ring Clasp . Solid 925 Sterling silver Solid Cable chain. Spring ring clasp. Chain thickness 1.5mm. New ListingMens Womens Sterling Silver 925 Cross Pendant Necklace 16mm 17.5-19"
14K YELLOW GOLD BAR NECKLACE PENDANT CABLE CHAIN. Width of Bar: 30mm x 4mm. Showcases a red pressed flower on a beige background, encased in an oval resin. • Petite 18" curb link chain. • Secure spring ring clasp. • Pendant 3/4 x 9/16". cabochon mounted on a sterling silver backing. 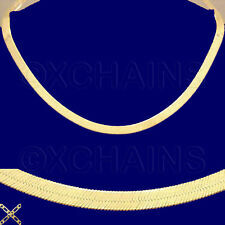 New Listing10K YELLOW GOLD TWIST Rope Chain Necklace 18" Long 3.9 gr. TWIST ROPE NECKLACE CHAIN. 10K YELLOW GOLD. UNLESS STATED AS NEW THERE WILL BE AGED RELATED WEAR AND OR LIGHT SCRATCHES. 14k Milor Yellow Gold Solid Snake Chain. Lobster Clasp. 1.36mm wide. Pearl Rings. 10K White gold. 10k Gold Charms. Wheat Chains. Rope Chains. Anchor Chains. Pearl Earrings. His & Her Ring Sets. Rich, regal Rolo - your first choice in pendant chains. 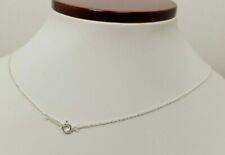 New ListingJAI John Hardy 55.3g Sterling Silver 18" Round Box Chain Necklace QVC $299! From JAI John Hardy. Sukhothai textured lobster claw clasp. SKUJ348411 - Bin AA6. Simple in sterling silver, this round box chain features a slightly oxidized finish for a dramatic finishing touch. Round box chain; slightly oxidized finish. The back is stamped S and 925 It is in the shape of an outline of a dove bearing an olive branch. Beautiful genuine. 925 Sterling Silver Peace Dove Charm Necklace. Tiny Hummingbird Outline Charm is made of genuine 925 Sterling Silver. Includes an 18" 925 Sterling Silver cable chain with spring ring clasp. Stamped 925. Necklace Details Arrives in a gift box. Theme: Animals & InsectsLength: 18 - 19.99"
14K Solid Yellow Gold (not filled or plated) Diamond Cut Twist Singapore Chain Necklace. Gorgeous head turning super sparkle. Pics don't do justice. Stamped 14k. About 18" in length and about 1.5mm in width. Material 14K Yellow Gold. 14K Gold, NOT PLATED. Stamped with 14K for authenticity. Length 18". Weight 0.9 Gr. Global-Jewels2006 has been in the jewelry industry for over 10 years. We are very confident you will be satisfied by the quality of our jewelry. Double feathers pendant and chain are made of genuine 925 Sterling Silver. 3D dangling feathers. 18" sterling silver cable chain included. Stamped 925. Necklace Details Arrives in a gift box. Chains are clearly marked for sterling. Both on the clasp and on the end link. Box chain is. 5mm in width. Quality made and shiny, shiny! You get four chains! All in excellent, unused condition. Ending Today at 5:16PM PDT5h 56mMetal: Sterling SilverStyle: ChainLength: 18 - 19.99"